When 999 came out, reviews marked it as a title that garners a re-examination of the visual novel genre. This wasn't the first game that questioned the existence of the genre, though. Capcom's DS remake of Phoenix Wright: Ace Attorney was a surprise hit in the US mostly due to the rather ridiculous dialogue (some of which became meme-worthy). After five successfully acclaimed games, its creator Shu Takumi wanted to work on a new project. 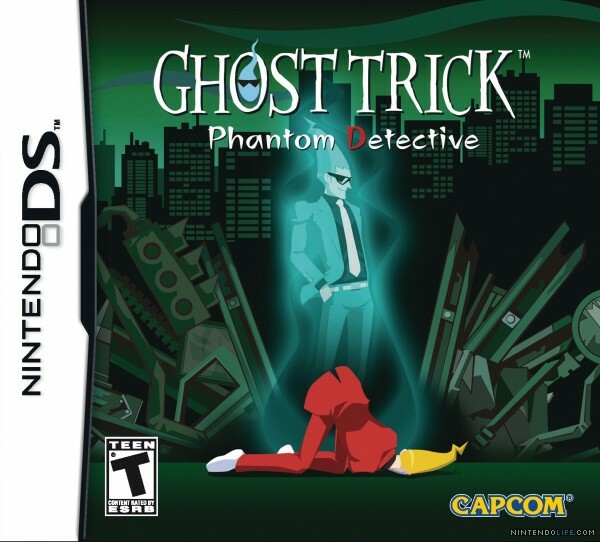 Ghost Trick: Phantom Detective was the result. I'm going to start the review by stating that this is one of the only 'DS-exclusive' games ever made. Every single feature in the game shows that this game was made for the DS in mind and it exploits all of its features that wouldn't be possible on any other platform (at least until the iOS came along and it received a port). 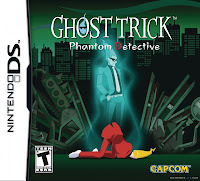 Many games like to use the DS's features for either interface reasons or because it's a popular platform for game development while Ghost Trick eschews this for features that expand on the innovation of the system. 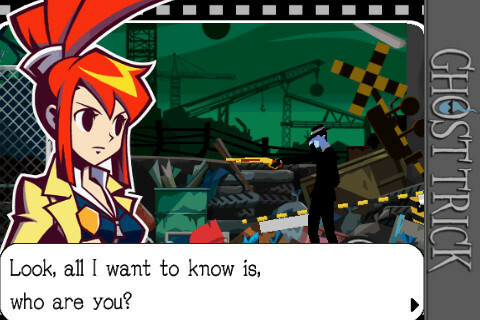 When the game begins you find yourself in control of a spirit who nicknames himself Sissel. You're instructed by another spirit called Ray to find out the secrets of your past and so begins your adventure as a ghost. The key feature of this game is Sissel's mode of travel. 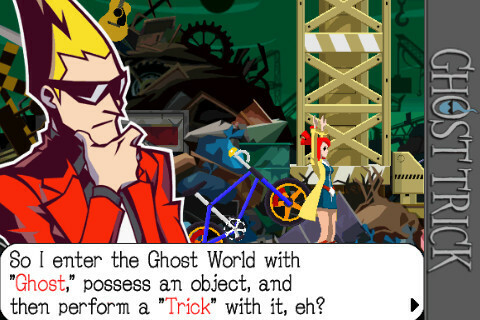 At any time Sissel can go to the spirit world where he finds a large assortments to objects to possess and even manipulate to travel through the area. 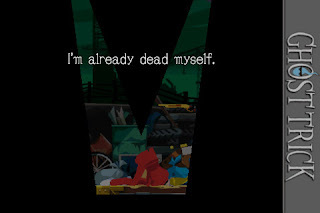 This style of gameplay evolves into a series of situations where sequences of events play out and you have to learn how to react to each event (similar to the security camera scenes in the last case in Ace Attorney). It creates a familiarity with the scene that makes the mundane situation rather endearing as you learn its intricacies in a way that doesn't get boring and is actually rather fun. These mise-en-scenes manifest through simple exploration, escape scenes, and preventions of world altering events which allow each chapter to tell something of consequence. What makes this game compelling is the balance between story and gameplay. Each aspect complements each other one while most games of this kind would use the gameplay as a means of progressing the story, the opposite isn't true for most cases. The key trick of this game (no pun intended) is the episodic nature of the game. While the story lines aren't as segregated as they are in a company like Telltale's efforts, the chapters in the game make the game almost like an interactive TV show, which is a cool idea. While this summation may seen disjoint (even more-so than my previous works!) I doubt a regular review would do justice to Ghost Trick. Most games present themselves as a series of events put into a sequence to aspire for 'a cinematic experience'. Ghost Trick takes these events and adds a strong narrative to compel the player to continue. In short if you like the Phoenix Wright games but wanted to control one of the victims then this is the game for you! I like the fact that there is a balance between story and gameplay, most games don't have it.